We retire several barrels from our oak aging program every season. We recycle or upcycle every oak barrel we use. One way to recycle a barrel is to cut them in half and make planter boxes out of them. T.L. demonstrates how to cut a barrel in half. In under a minute, we cut up several barrels for our upcycle program. 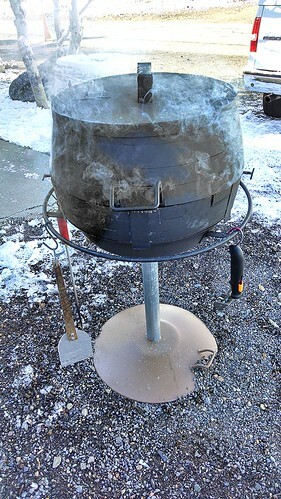 Using the galvanized metal rings, a kettle-style BBQ/smoker was created from scrap, a disk blade from the farm and a little know-how. And yes, we're even burning the oak from the barrel itself for the fire. We are constantly thinking about ways to use and re-use our retired oak barrels at Mastro Scheidt Cellars with T.L. taking the lead on fabrication and David thinking about new ways to use a field disk blade to make a BBQ.